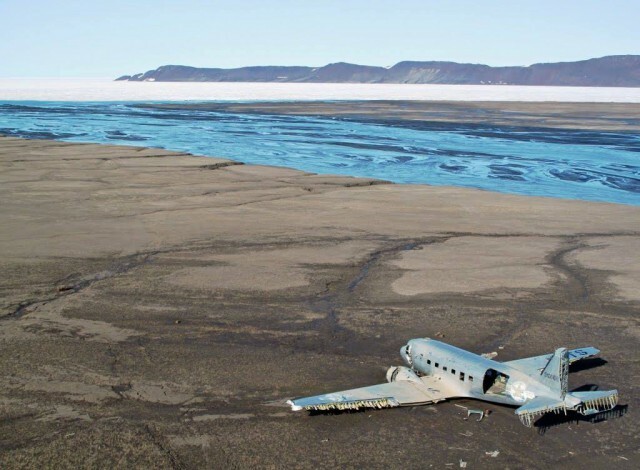 During my multiple expeditions since 1990 in search of the legendary Gooney Bird, I ran into many DC-3 derelicts, C-47 wrecks, abandoned Dakotas and fortunately, I also found an equal or higher number of DC-3’s that still exist until today, fully intact or even flying. Depicted below you will find many outstanding photos of wrecks, from various sites and photographers. Some are well published, others hardly known. 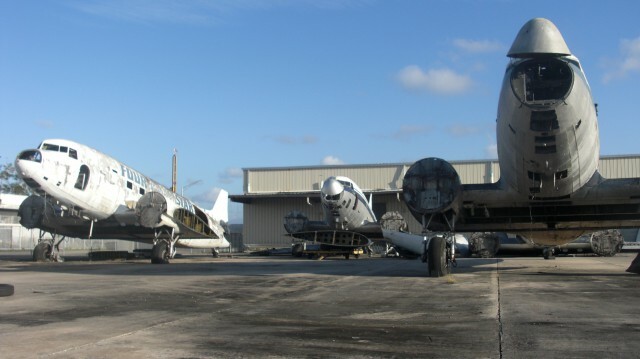 All carry their story and have an unparalleled beauty, as the superbly designed silhouette of the aircraft is warping over the years due to corrosion, souvenir hunters, and decay and takes a unique shape in its environment. 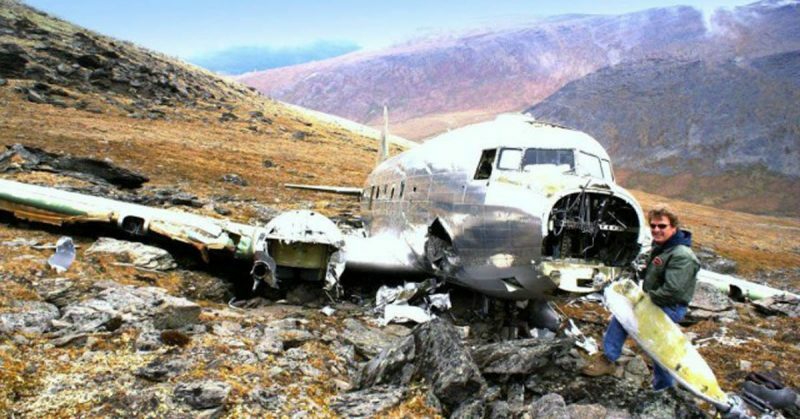 One of the most remarkable DC-3 crashed wrecks that I encountered in all those years of scouting is in the Yukon, NW Canada. High up in the Ruby Mountains, I met an amazingly intact wreck of a USAF C-47 that made a luckiest crash landing in January 1950 on a snow covered hill at some 6600 feet altitude near the Gates of the Arctic. In my book, you can find the harrowing story of that crash, the photos, and the aftermath. A 10 men crew in a flying coffin that ran out of fuel over the mountains and glided down into the deepest dark of a near-Arctic winter. They made a most fortunate stall/ landing over the hill side, the plane almost intact but their ordeal was not yet over. With heavy snowfall soon covering the entire aircraft, the Captain went out for help, walked for 12 agonizing hours and hit by sheer coincidence the Alaska Highway. They found him nearly frozen to death. Read the conclusion of this story, it is an incredible tale of fortune, determination and about the unrivaled ruggedness of that legendary aircraft. My fascination for wrecks started with me at a very young age. Since 1950, I lived for years in Borneo, that only 5 years earlier had escaped from the Japanese occupation (Feb 1942- July 1945). In the final stage of that Pacific War, the Allies started bombing the Eastern Borneo oil refineries and port facilities with B-24’s and B-25’s in 5 most daring raids from New Guinea (Biak Islands), 2500 miles over sea and enemy territory!. 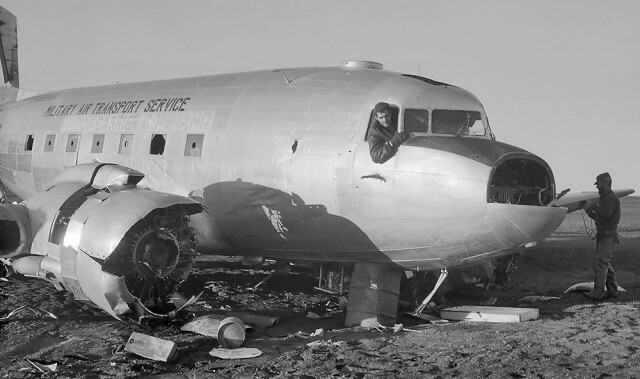 The same C-47 pic taken shorty after crash. By the end of June 1945, an invasion took place on the Balikpapan shores by Australian Forces with Naval and Aerial support from the Americans. That assault left its traces with a load of war inflicted junk. As a most curious kid, the Gates of Wonder opened up for me, and I started to explore a ravaged world of wrecks, bunkers, unexploded bombs, landing aircraft, etc. It was like an open air war museum. But there were also the survivors, transports galore left behind by the Allied Forces, my Daddy’s Jeep, the C-47/ Dakotas and the PBY-5A Catalinas (operated by Shell, KLM and Garuda), the GMC Trucks and, much more to our dismay, lots of Japanese weapons that evidently often had ended up in the wrong hands of looting gangs, or self-proclaimed “Freedom Fighters”. That inquisitive Borneo Jungle kid would forever stay in me, I could never fully part from that epic Pacific sojourn, and I still have a strong urge to explore the wrecks, in particular, the Dakota, lost in the mists of legends. Once found, they show themselves in all their magic as genuine time capsules. Apart for the Yukon wreck depicted which one day I will definitely visit again, you see here a wishlist of wrecks/ abandoned DC-3’s to go in near future. 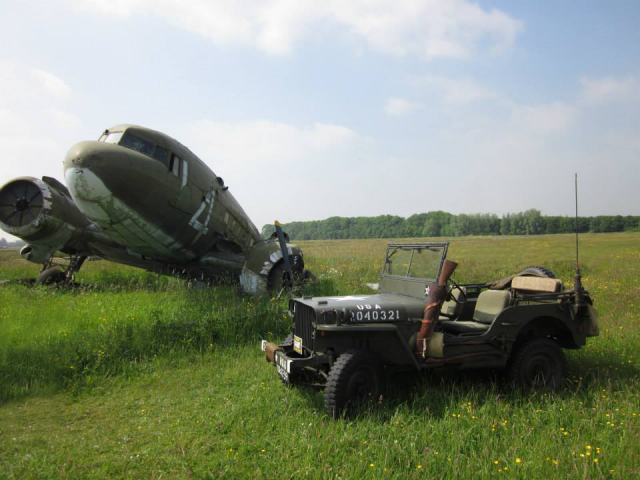 One day in 2013, I was the fortunate son, that was offered a C-47 wreck for sale, not in remote Absurdistan but almost in my own backyard. On the holy grounds of former Air Naval Station Valkenburg, there was since 3 years laying in agony a Dakota that had been trashed in a road transport accident on the way to eternal fame as a Musical star. But fate took her in another direction, and that intended career ended before it had begun. But yet another career loomed. The wreck came for sale, and I bought my first Dakota with no other option than to take her apart in Sept. 2013 and salvage the best parts. Her cockpit is now being modified by MPS to world’s first certified Flight Simulator for DC-3 pilots licensing. To be operated by DDA, (Dutch Dakota Association) in Holland, where dozens of pilots eagerly wait for the completion of this Hi-Tech instruction platform based on a 70-year-old WWII War Bird. With an Imax-like 3D projection screen wrapped around the cockpit nose and state-of-the-art technology, this cockpit mimics the DDA DC-3 “Prinses Amalia” instrument layout and controls feedback. My beloved first Dak baby will soon fly again, not really High in the Sky.but in a virtual reality, serving the DC-3 loving community for another 3 decades or more!. She will almost for sure still be there at the 100 years anniversary of the DC-3 in 2035, maybe even still instructing a few pilots that fly a rare Dakota. The plane that changed the world in 1936 is the only transport in the world still operational in numbers at her current 70 years of age. Bravo and congratulations with all the missions accomplished over three wars and beyond. If interested to read what happened out there with that aircraft in the Yukon, in Thailand, Bolivia, Madagascar, Colombia or Honduras, you should read my book The Dakota Hunter. packed with 320 pages of authentic, fascinating DC-3/ C-47 related tales and 250 gripping photos as evidence of the unbelievable! You can follow me on www.facebook.com/thedakotahunter. For more information of the wrecks that I found and visited over the years, please view www.dc3dakotahunter.com where you can order the book directly at Amazon, Barnes & Noble etc.